The Proform CrossTrainer VX treadmill is one of those Proforms that doesn’t come with the company's classic 90-day warranty. Instead, it comes with an extended motor warranty of 3 years. This treadmill is perfect for beginners and for those who would use it lightly. If you are a serious runner, this model is not for you. I suggest you buy a treadmill in the $1,500 or above price range. See our best buy treadmills page. The 1.5 CHP Mach drive system employs a built-in cooling fan to cool internal components and extend the motor's life. This is the main reason why Proform extended the motor warranty of this treadmill. The One-touch QuickSpeed control allows you to change the speed of your run from 0-10mph without the need of holding down the speed button. While the power incline feature can elevate the treadmill for up to 10% to give you a more intense workout. However, due to its cheap internal parts, I wouldn’t recommend maximizing this treadmill’s full capabilities. The 18” x 50” tread belt might be a little small for most people. So be sure you try running on it first before deciding to buy. The 4 window LCD display shows your feedbacks which include your speed, pace, time, distance, laps, incline, pulse and calories burned. With these informations, you'll always know whether or not you had an effective workout. 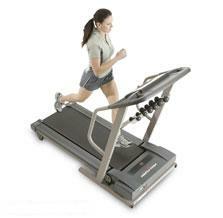 The Proform CrossTrainer VX treadmill also comes with 4 workout options. Plus, you can also use the iFIT Speed Interactive training if you want more variety. Like most Proform treadmills, this one also has some quality and reliability problems. Other than that, this model is pretty ordinary. Unless Proform improves the quality of their treadmills, I would not recommend Proform treadmills, including the Proform CrossTrainer VX treadmill. If even after this review you still want to buy a Proform CrossTrainer VX treadmill, I suggest you buy it at amazon. They offer the cheapest price around the net. You can get it for just $499.